Bennet has a basket of toys that all our doggy guests love to rifle through. 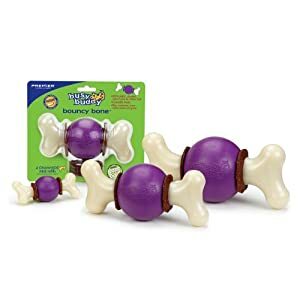 Today I'm sharing some of my (and Bennet's) favorite dog toys that have been helpful in keeping Bennet away from chewing up the sofas and barking at every bird that flies by. First up is the Monster Ball, which I first saw and bought at Centinela Feed, my pet store of choice. In between its jaws, you drop some treats, and your dog will roll the monster ball around, chewing it, shaking it, etc. in order to get the treat. It's what I've been leaving Bennet with each morning to find and play with after I go to work. The absolute favorite is Busy Busy Bouncy Bone, which you unscrew to add a ring of rawhide. I usually buy this on Amazon. 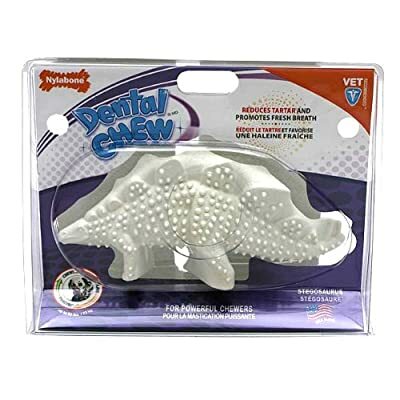 It's a good way to get a dog to start chewing plastic bones instead of chewing up your furniture or shoes. I usually only give this to Bennet once a week - I want to limit his intake of "junk food." I also usually hide it somewhere in the house and he has to find it if he wants to chew on it. 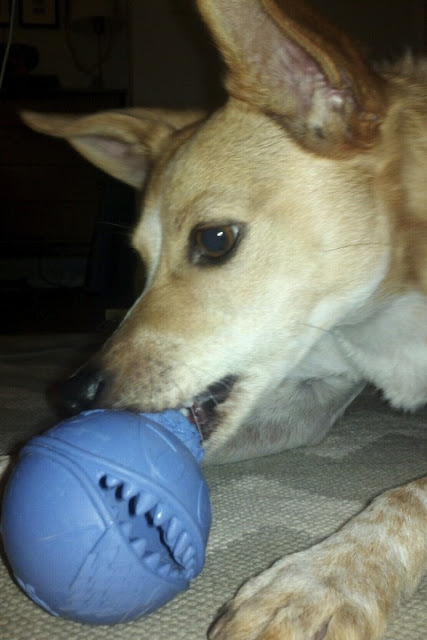 After he eats the rawhide, he will continue to chew on the plastic bone part, which is great for relieving tension. Nylabone is safe for dogs, and I've gone through a ton of these. Usually they're just shaped like a regular bone, but for Christmas, I bought Bennet the dinosaur shaped one. Like the other toys in this category, it's good for relieving any of Bennet's built up anxiety and boredom. 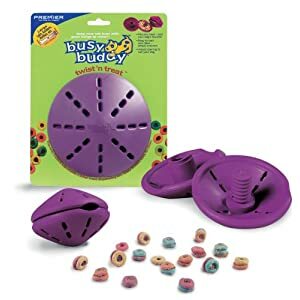 Since I liked the Busy Buddy so much, I checked out some of the other toys from Premier. I bought the Twist N Treat, which randomly dispenses treats/food. I used to give this to Bennet every day before I found the Monster Ball. I alternate with this and the Monster Ball, but this one dispenses food randomly, so it goes much quicker. I think all dogs are different, but Bennet tends to carry this to a spot where it won't move and get the food with his tongue. I think dogs are supposed to push it with their noses and paws to get the food out. This is Bennet's favorite type of toy. I can't say he has a favorite, bc he just loves all of these. When Bennet was a puppy, he loved to chew on fabric: blanket, plush dolls, sofas... Now that he's a mature gentleman, he loves his squeaky toys carefully. I found this set of 3 dolls at Costco last year and I was so mad that I cut the tags off bc ALL dogs love these. They have a squeaker in the middle, and they're the perfect length to play tug of war, or cuddle (body pillow for Bennet). Luckily I found the same chipmunk at TJ Maxx, bought it and saved the dog. FYI, the company is Think!Dog. Sort of hard on you but much loved by the dog is the puppet. Bennet goes nuts when I pull out the puppet. I think he thinks he's boxing. I can't find a link, but I buy them at Ikea for a few bucks, and Bennet goes crazy. Currently I have a lion puppet, and I used to have a moose puppet whose tongue Bennet ripped out. What a sweet dog. It's nice to have some interactive toys. 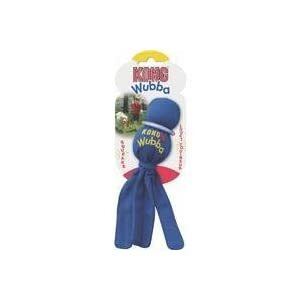 BDF calls this one the Octopus, but actually it's just called KONG Wubba. This one was one of Bennet's first toys that he actually liked. He doesn't like the original Kong, but he loves chasing this guy and shaking it. He whips his head back and forth as if he's a killer dog. Pahaha. 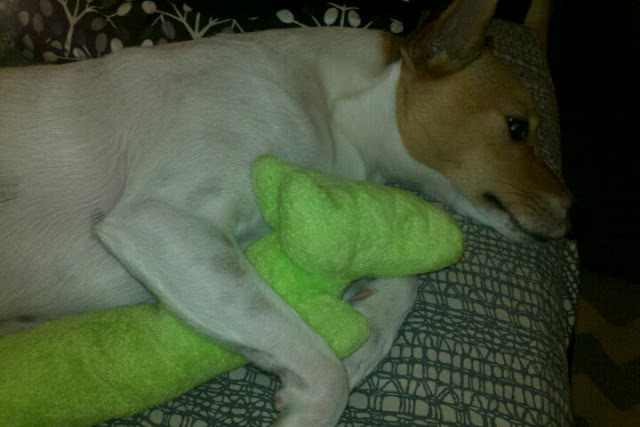 This toy looks like nothing special to me but Bennet and Smash (BDF's dog) love it. thanks for all the toy ideas. i think E already ordered at least one of these for our guy. FYI, you should check out: http://www.globalpetfoodoutlet.com/locations.html - their prices are lower than petco and centinela pretty much across the board, and they have a huge selection too. Sweet. Thanks for the tip.